That’s pretty awesome but is that all we have to do? What changes to the DNS settings do we have to make to make sure the domain points in the right direction? Spacechimp, you will need to setup a wildcard subdomain with a single A record that sends all requests to ANYNAME.yourdomain.com to your server. 2. Added my primary domain to my VPS and the other ones as virtual hosts (you can also use a wildcard subdomain). 4. Create new sites and change the site URL as shown on the screenshot in the post. I added a link to my signature for more detailed instructions. – I have a multisite installation with sub-directory approach (not sub-domains). – primary site has its own domain (ex: abc.com) but not for the sub-sites in the network. So all the sub-sites will look like this: abc.com/sub-site1 so on. Now the question is do I even need domain mapping? Any suggestion will be a great help. Umesh, for a setup like you described you don’t need the domain mapping plugin. Everything should work just out of the box. Hey Kaspars, thank you for writing this. I use WP MS with domain mapping for a small (18) blog network, where users can register in any site and comment in any other with single sign-on (I use “Remote login” in the domain mapping plugin). Users login at domain.com/login/sitename/, not at each site’s singledomain.com. If I disable the plugin and start using your straightforward technique, would I lose the single sign-on part? I know WP MS is designed closer to WP.com with many unrelated blogs, instead a tightly-knit blog network. I’d like to know if someone experienced this before testing with a live site (and I know, I should have a staging environment, but every day that passes is a heavier task). Hernan, I haven’t used the plugin you mentioned so I won’t be able to comment on it. I think creating a test setup locally would be the best approach for finding out if it works or not. Are there any security implications with removing the COOKIE_DOMAIN ? No security implications, Lee. Your browser will set the cookie domain to the current domain by default. 1. Implication on the SEO with this method? 2. Following the “recommended” method, to be able to use top level domain, the wordpress space must be put at the base root of the server, wich can be annoying. What about it with your method? Didier — 1. there are no SEO implications with using either of methods. Search engines care only about the site content. 2. WordPress can be placed anywhere on the server as long as the web server knows which domains should be sent to that WordPress instance. THANK YOU so much for the COOKIE_DOMAIN tip!! My multisite install hasn’t been working, and I’ve been looking all over for a fix and didn’t get any help from the WordPress forums. Now it works! Thank you! Bingo,exactly what i was looking for . that say 1 Add the following to your wp-config.php file in…. 2Add the following to your .htaccess file in ….? Tomlee, you shouldn’t skip that part. It is required for WordPress to actually know it is being used as multi-site install. Yes, definitely brilliant. I’ve been using a Domain Mapping plugin for the last couple of years and today I learnt it was useless! Why is this not documented in WordPress.org Codex? 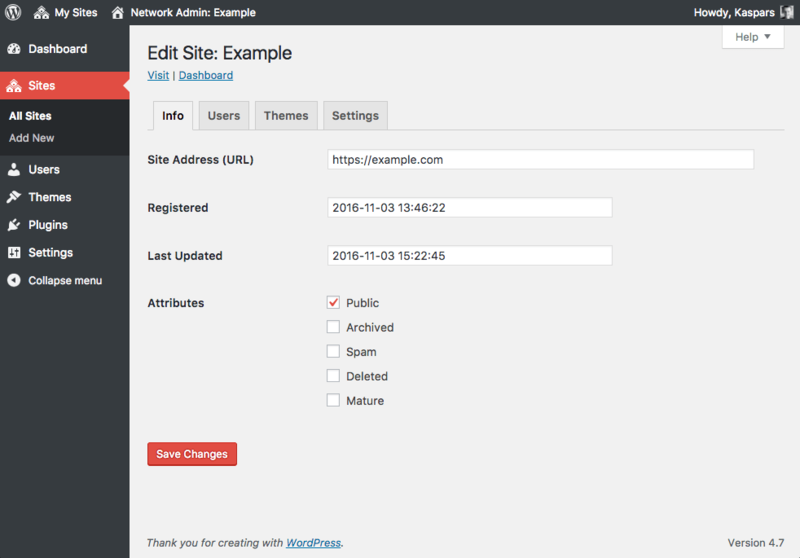 Is it not a basic feature for WordPress Multisite? Thanks for the #protip… Happily working away on multisite locally now, woot! I followed this blog post to set up domains for WordPress Multisite. My only problem is that all images are uploded and served from main domain. Do you know how should I set it up that images uploaded from secondary domain will be uploaded to and served from secondary domain? Looks like wp_upload_dir() is prepending the wrong URL to all asset URLs. The only way this can happen is when get_option( 'siteurl' ) returns the URL of your primary site. Could you please check the value of siteurl in /wp-admin/options.php of handysvandy.net.